​Over many shallow sandy-bottomed expanses of sea floor, especially in the tropics, there are vast meadows of marine plants. Some portion of this growth is formed by red and brown algae that have recently adapted to use C4 photosynthesis, but the majority of these meadows are formed out of true plants, the seaghum. Seaghum (Maresorghus sp) is a marine herbaceous plant that greatly resembles knotty seagrass, being descended from C4 photosynthesising land plants of an earlier age. These plants form dense carpets of weedy growth which can extend for many kilometres. It provides shelter and food for a wide range of marine invertebrates and keeps the sea-floor very fertile. Gastrotees (Manatolimax gigantea) are the most prominent creatures of the seaghum meadows, being enormous herbivorous slugfish some 3.5 meters long. They move about in herds of up to 10, constantly cropping and chewing up seaghum and algae with their muscular radulas, which are mounted upon the end of a long roving proboscis. Gastrotees move about relatively slowly, but if they are attacked by a large predator, they release a cloud of noxious purple ink to confuse the attacker. In the summer, gastrotees mate en masse, laying large stringy clusters of eggs that they attach to thick growths of seaghum. The young are about finger-length when they hatch, and fully independent. Grasser slugfish (genus Cyprinoradula) are fair-sized slugfish that reach up to 70 centimetres long. They are very common in the seaghum meadows, being devoted herbivores, cropping and chewing growth with their large muscular radulas. Grassers can be found in shoals of up to 15, methodically working their way over the meadows, selectively chewing off and eating choice pieces of seaghum and algae. 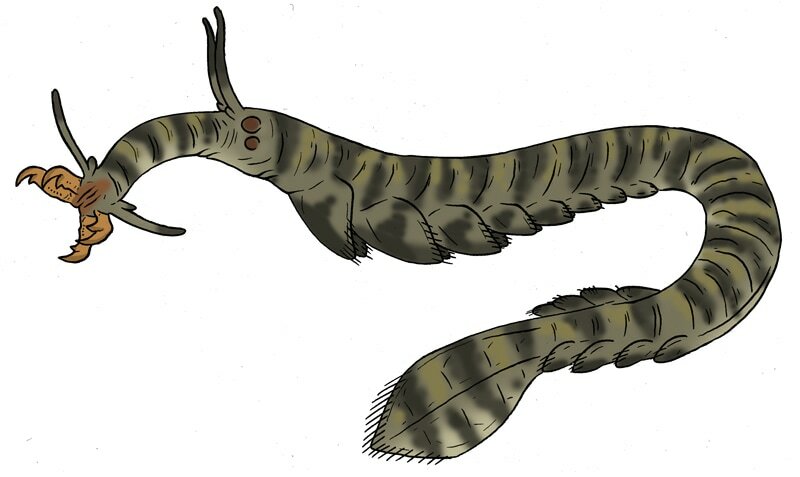 Not all inhabitants of this period vary greatly from their ancestors; the Mail-slab (Hoplolimax squamodermus) still greatly resembles its distant ancestor, a kind of herbivorous sea snail. A fair sized animal, it reaches 60 centimetres long, and in order to facilitate movement, it has mostly foregone a full shell, wearing a chainmail like coat of calcareous scales instead. It is exceedingly common in the Seaghum meadows, and indeed Seaghum is pretty much all it eats. Being able to crawl fairly quickly in comparison to typical snails, when attacked it will retract its more vulnerable parts under the scaly, mail like coating on the upper part of its body. Eelorms are large predatory worms related distantly to fwirms, and are relatively common ambush predators, especially in the seaghum meadows. One member of this group is the banded eelorm (Annelanguilla ferox), which reaches up to 2 meters long. These predators lurk hidden in the weedy growths of seaghum and algae, ambushing various free-swimming marine invertebrates such as slugfish and crustaceans. Its wicked seizing mouthparts are mounted on the end of a long muscular proboscis; prey is usually killed outright with the first strike. Hidden in the tangled growth of the seaghum meadows, the Weedsleeper (Platyvermis atrox) is a fair sized, voracious ambush predator reaching about 70 centimetres long. Squat and armoured, it sits in wait for swimming prey to happen past its hiding spot, lurching forward to seize them, crocodile-like, in its massive mouthparts. Weedsleepers bear mottled colour patters of brown and green that allow them to blend into the beds of seaghum perfectly. Despite appearances, it is actually descended from polychaete worms, though it has lots its serpentine shape entirely. ​Starpike (Asteroesox sp) are a large kind of asterothere that are most common in the seaghum meadows, but are also found in smaller numbers around the outskirts of reefs. Starpike reach 90 centimetres long, and differ from other asterotheres in having large seizing pincers for catching prey, these are formed from the pedicellariae of their starfish ancestors. Though they are able to chase prey for some distance, they prefer to catch prey from ambush, often hiding amongst particularly dense growths of seaghum.